Russia’s major business and political event, the 17th St Petersburg International Economic Forum, has been scheduled for June 20-22, with over 5000 participants from 30 countries worldwide expected to attend. The 17th St Petersburg International Economic Forum (SPIEF) will take place on June 20-22. The forum is dubbed the ‘Russian Davos’, and rightfully so, considering its scale. Its main focus will be on what has become a fairly hot topic: ‘Finding Resolve to Build the New Global Economy’. “The St. Petersburg International Economic Forum serves as one of the key platforms for the discussion of the economic agenda, both domestic and international. Our idea was to thrash out an agenda that is relevant to its status,” Director of the Department for Investment Policy and Development of Private/Public Partnership of Russia’s Ministry of Economic Development Igor Koval said. The fact that Russia currently holds the rotating G20 presidency further emphasises the topic. “This year, the G20 agenda will be crammed into the forum’s programme,” Koval divulged. The issues include, among other things, encouraging investment in order to propel economic growth, managing public debt, reforming the international financial system, developing the energy markets in a sustainable way, as well as boosting global trade. German Chancellor Angela Merkel and Prime Minister of the Netherlands Mark Rutte are expected to attend the conference. It should also be noted that, ahead of the ‘Russian Davos,’ G20 youth and B20 business summits are expected to be held within the SPIEF framework. It is widely expected that the main topic for discussion will be how to reinvigorate the economy and achieve sustainable economic growth – this is a fairly urgent task that many countries are now facing. The key factors that impact global economic development, as well as the steps needed to restructure the global economy and encourage sustainable growth, will be discussed as part of the ‘Global Growth Agenda’ umbrella theme. The forum will bring together key representatives of the global business community, as well as the political and economic elite. They will take part in the traditional and highly regarded SPIEF ‘Sessions that Change the World’ series of meetings. For instance, last year the meetings were attended by Goldman Sachs head Lloyd Blankfein, Mangrove Capital Partners founder Gerard Lopez and Nobel Peace Prize recipient Henry Kissinger. Two more highly relevant topics on the agenda are ‘Russia’s New Horizons’ (top priority development areas for the Russian economy, as well the country's international standing, to be attended by representatives of the Russian government), and ‘New Catalysts for Change’, which focuses on the potential of cutting edge technologies and innovative approaches for resolving economic and social problems. In addition, the SPIEF will also host its traditional summit of energy companies, at which Rosneft signed a series of contracts last year, including with Eni and Statoil, regarding the Arctic, in return for access to oil refining facilities in Europe, northern African fields and other assets. The first ministerial meeting to discuss a Comprehensive Economic Cooperation Agreement (CECA) between India and the Customs Union of Russia, Belarus and Kazakhstan will be held on the sidelines of the forum. The St Petersburg Economic Forum has come a long way since its first incarnation. No more than a local conference up until the mid-2000s with the number of its participants rarely above 2000, the Ministry of Economic Development, led by then Minister and currently Sberbank CEO German Gref, started to push for the forum to be positioned as an international platform. Supported heavily by Igor Shuvalov, the forum later reached its peak as the premier business forum in Russia. 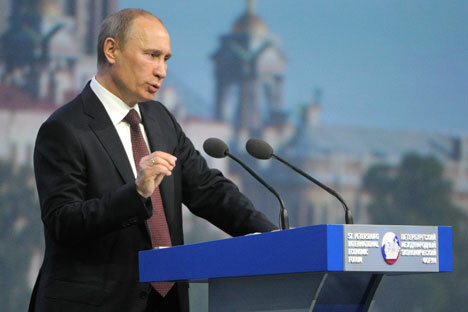 The forum currently serves as a benchmark for Russian public officials to gauge preparations for international events. “The St Petersburg Economic Forum has become the model forum held in Russia,” Deputy Minister of Economic Development Oleg Fomichev said. Indeed, there are quite a few things to admire about it: last year, it was attended by over 5347 business people, including heads of 157 of major foreign companies, with 55 of them listed in Forbes and Fortune rankings. The forum resulted in 84 agreements signed, including 8 contracts for over 360 billion roubles (around $12 billion), four of which had a total of 164.4 billion roubles (about $5.5 billion) in credit facilities. It also received extensive media coverage, with 1139 journalists from 30 countries working in attendance.